Lionel Messi is reportedly unconvinced by Ousmane Dembele and wants Barcelona manager Ernesto Valverde to change his team around a little. 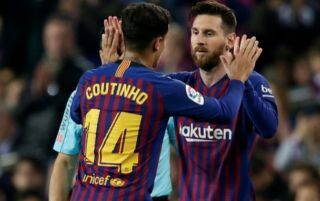 According to Diario Gol, the Argentine superstar believes summer signing Arthur should become first choice in central midfield, allowing Philippe Coutinho to move further forward into Dembele’s role in the front three. The young Frenchman has struggled at Barcelona since joining from Borussia Dortmund last season, though injuries played their part in a below-part debut campaign and he’s looked better this time around. Still, Dembele’s future remains in doubt as Don Balon just recently mentioned a number of clubs continuing to keep an eye on his situation. That report listed Chelsea, Arsenal and Paris Saint-Germain as potential suitors for the 21-year-old, and he’d undoubtedly strengthen any of those three. Ousmane Dembele to Arsenal or Chelsea in the January transfer window? Chelsea could do with a top young attacker as a long-term replacement for ageing duo Willian and Pedro, while Dembele could even in theory challenge Alvaro Morata for his place up front. Arsenal, meanwhile, could also do with a quality option on their left-hand side, which would mean being less reliant on flop duo Danny Welbeck and Alex Iwobi. If Diario Gol’s report is correct and Messi wants Dembele out of the team, that could play right into Arsenal and Chelsea’s hands once the transfer window re-opens in January.